An Empty tomb of Jesus? In Jerusalem's Church of the Holy Sepulchre, JC's "passion" and "resurrection" are conveniently sited under one roof. The church, built by Crusaders on earlier foundations, contains a bizarre assortment of altars, chapels, and religious curios. The building's motley array of architectural styles complements the uneasy division of the theme park between six franchisees – Latin, Greek, Armenian, Coptic, Syrian and Ethiopic. The keys to the place are actually held by a local Muslim family – an ancient custom that keeps the peace between not-so-loving Christians. Does this look like a tomb to you? This grotesque confectionary is the centrepiece of the Church of the Holy Sepulchre. The "tomb" is about as genuine as a hammer that has had three new heads and four new handles – and that's assuming there was ever a tomb in the first place. Investigation of the site is tightly controlled by a consortium of the three major Christian faiths which profit from the shrine's "authenticity", the Latin, Greek and Armenian churches. Relations between the various Jesus fan clubs were not always so harmonious. Candlesticks, rugs, lecterns, etc., used to mark out territory, are a continuous source of friction. In earlier times gang warfare led to mayhem. "At the Easter festival in 1834, a fight took place in this church which resulted in the death of four hundred people." Greek Orthodoxy is closer to the original church but historically has been the loser to an imperial Catholicism. Whatever the monument began as in 325 AD, the Edicule was completely destroyed by Caliph al-Hakim in the early 11th century. Later rebuilt, it again fell into ruin and was rebuilt in 1555, this time from its "first foundations". After fire damage, yet a third rebuilding took place in 1809/10. Damaged by an earthquake in 1927, the Edicule has been held together by a brace of timber and steel since 1927. The current Edicule is about 25' in length - plus a carbuncle on the back end added around 1818 which serves as a shrine for the Coptic Christians. They sell blessings and a peek at bogus "original" rock, visible in a cupboard beneath a small altar. Was there ever a real tomb? A glimpse of the original Constantinian "tomb of Jesus" from a 4th century ivory. Even here, the Edicule does not reveal a genuine tomb. Plan of the supposed original tomb, cut free of the bedrock and clad in its 4th century marble sheathing. Hard to imagine all the comings and goings of the passion narrative in such a confined space. Note that there is no ante-chamber "tomb of the angel" – that was added centuries later to fit in with the gospel fable. The structure built by Boniface of Ragusa, the Franciscan guardian of Jerusalem's holy places. Boniface had a marble slab, complete with faux crack, fitted over the alleged burial couch of Jesus. Boniface also added a larger second chamber, no doubt large enough to accommodate three women and a couple of angels. Or is that several women and a couple of apostles? Greek, Catholic and Armenian Christians share the main structure. To placate the Copts and give them a slice of the action a small chapel was added to the back of the Edicule. Chapel of the Angel, complete with the Altar of the Rolling Stone. No kidding. This is it – the LORD's tomb, sheathed in marble and not a rock to be seen. The chamber is about 6' by 7' – scarcely room for an angel to spread its wings. Does the cladding keep the chamber safe from sovereign hunters – or merely inhibit too close an inspection by the skeptical? In their determination to fit fable and fabrication into verifiable history, Christian apologists have to maintain that the hill of Calvary (Golgotha) was outside of a wall "but only just". But such a configuration would make nonsense of any defensive wall by providing the enemy with a ready-made siege ramp. A ditch, not a hill, would normally augment a wall. The wall in question has never been found. For that matter, nowhere in the New Testament does it say Golgotha was a hill. Piety added that detail. The anonymous Pilgrim of Bordeaux in 333 AD is this first to refer to Golgotha as a "small hill". Despite its questionable provenance, a slab of innocuous bedrock gets 5-star treatment inside the Church of the Holy Sepulchre. Alexander the Great – a "man made god" and entombed in splendour. Augustus was the first of many emperors who paid homage at his tomb and he used the image of Alexander on his official seal. It was all too much for the Christians. 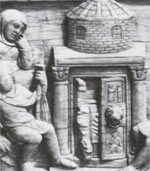 The tomb of Alexander disappeared shortly after the tomb of Christ appeared. "Herod the tetrarch, who was in great favour with Tiberius, built a city of the same name with him, and called it Tiberias. He built it in the best part of Galilee, at the lake of Gennesareth. There are warm baths at a little distance from it, in a village named Emmaus." Josephus tells us that in the construction of Tiberias, "many sepulchers were to be here taken away in order to make room for the city". – Wars 4.1.3. No doubt the extensive building work at Tiberias caused a scramble to remove venerated ancestors. Could this have seeded the notion of an "empty" tomb? Real Tombs - but whose? Two "kokhim" or shaft tombs found close to the west wall of the Holy Sepulchre church. Piety alone identifies them as the "tombs of Joseph of Arimathea and Nicodemus." Fat chance. They certainly confirm a burial site within the environs of the Church of the Holy Sepulchre – but from what time period? If the shafts date from several centuries BC, they do nothing to substantiate Christian claims that the area was a precinct of execution, burial and a garden in the "time of Jesus". The evidence of the kokhim shafts suggests that they and any "tomb of Jesus" a few yards away must have been part of a single catacomb typical of the area in the 1st century BC. Not exactly the fresh cut, unused tomb of the Jesus legend. Syrian ("Jacobite") chapel in the Church of the Holy Sepulchre. When a general festival was to be celebrated, he put on the holy garment, and went into the temple to offer incense to God upon the golden altar, which he was prohibited to do by Azariah the high priest, who had fourscore priests with him, and who told him that it was not lawful for him to offer sacrifice, and that "none besides the posterity of Aaron were permitted so to do." ... He threatened to kill them ... a great earthquake shook the ground and a rent was made in the temple ... leprosy seized upon him immediately ... He was so confounded at the sad distemper ... for that impiety against God ... So he abode out of the city for some time, and lived a private life, while his son Jotham took the government; after which he died ... and was buried by himself in his own gardens." In Christian iconography, Adam' skull lies within the pyramid-shaped hill of Calvary. A Discovery Channel special aired early in 2007 and followed by the book The Jesus Family Tomb argued the case for yet another Jesus tomb. A Messiah can have as many tombs as he likes, right? Some insight into Christian shenanigans can be gained from the entertaining report that a 17th century Grand Duke of the Medici family had plotted to steal the Holy Sepulchre and whisk it back to Tuscany! The Medici – the family that produced three popes (Leo X, Clement VII, and Leo XI) – were particularly peeved that the rival House of Savoy had acquired that wonderfully lucrative fraud, the Shroud of Turin. A Franciscan friar in the pay of Ferdinando II de' Medici suggested a bold counterstroke: removing the Holy Sepulchre to the new Medici church of San Lorrenzo in Florence. The scheme was hatched in cahoots with a renegade Muslim Prince Fakhr al-Din II, who would seize Jerusalem from the Turks. Unfortunately for the plotters, an Ottoman fleet arrived on the coast and chased Fakhr al-Din into Italian exile, where he lived in splendour for five years at Medici expense. A state religion needs the paraphernalia of public sanctuaries, "holy places" where the serried ranks of the faithful can prostrate before the gods and abase themselves before the earthly legates of the divine. No more is this true than in the delirium of religious revolution when the old gods are thrown down and a new god enthroned. Such was the religious revolution of Constantine. Where better to place the "life and times" of the new god than upon the sacred places of the old? The literary basis of the Christian holy drama was obligingly vague. The gospels failed to identify precisely where the hero of the Christian story "conquered death" – but then those same gospels failed to substantiate every other salient detail of Jesus' life. It should surprise no one that the venues of his death and entombment are clouded by contention and doubt. Thus it comes as something of a revelation to discover that not just the purported tomb of Jesus but also the alleged place of his execution are to be found within a single building. Is it really tenable that the godman's tomb could have been less than thirty metres from the site of his crucifixion? Calvary and the Holy Sepulchre are pivotal points in the Christian dreamscape – but were they ever a reality in the known universe? "And he bearing his cross went forth into a place called the place of a skull, which is called in the Hebrew Golgotha ...The place where Jesus was crucified was nigh to the city." – John 19.17,20. "Jesus ,,, suffered without the gate. Let us go forth therefore unto him without the camp." – Hebrews 13.12,13. Golgotha – otherwise known as Calvary from the Latin for skull, calvaria – can be seen today in two places, one identified by a Christian fanatic in the 19th century, the other identified by a Christian fanatic in the 4th century. Neither is genuine, of course, but the weight of "tradition" favours the earlier identification. To fully appreciate how the earlier fraud was concocted it is instructive to review how the recent Victorian chicanery was assembled from a heady mix of pious enthusiasm, amateurish "archaeology" and religio-political imperatives. Quite simply, the Protestants wanted their own sepulchre, free of Catholic idolatry, and in a larger than life scion of the British military establishment they found their man. General Charles Gordon, in an interlude between sacking Nanking and dying at the hand of the Mahdi in the Sudan, brought his Evangelical fervour and wide-eyed mysticism to the city of Jerusalem. Palestine at the time – 1883 – was a province of an Ottoman empire increasingly at the mercy of the European powers and Britain had just seized Cyprus from the perfidious Turks. Gordon was contemptuous of the Catholic, Greek and Armenian monks that had turned the Church of the Holy Sepulchre into a thieves' market. That alone convinced him that the true tomb of Christ must lie elsewhere. Some forty years earlier an Otto Thenius had directed pious attention to a hill north of the Damascus Gate, whimsically named "Jeremiah's Grotto" in the 15th century, and Gordon, like Thenius, could see in the hill's contours the features of a human skull (or at least a couple of eye sockets). Christian mysticism – or perhaps we should say, lunacy – did the rest. "Skull hill" does contain a tomb (several in fact) – unfortunately dating from the Iron Age and tarted up by Byzantine Christians when building the monastic complex of St. Stephen's. Yet despite the transparently fake credentials, the so-called "Garden tomb" still draws the crowds. As Murphy O'Connor cheerfully admits (The Holy Land, p125. ), "In Jerusalem the prudence of reason has little chance against the certitude of piety." On the wilder shores of biblical mania there are still fools and charlatans who feed each other superlative nonsense about the "Ark of the Covenant" being found directly below "Gordon's Calvary" but – don't tell anyone – the discovery is kept secret by the Israeli government in the interests of public order! Like an early-day David Icke, General Gordon could see cosmic design drawn on a vast canvas. The Bible – you may have guessed – was his guide. Jesus on his cross had embraced the whole city of Jerusalem and his true sepulchre obviously lay within the skull-shaped hill the gospels appropriately had named Golgotha. Arcane wisdom, obliquely referred to by the books of holy scripture, confirmed that this was the spot and of course it looked right – modest, peaceful, a real tomb, and a garden – every Protestant's idea of what the tomb of Jesus should look like. "You cannot help seeing that there is a body, that Schick's conduit is the oesophagus, that the quarries are the chest, and if you are venturesome you will carry out the analogy further." – Gen. Gordon, Palestine Exploration Fund Quarterly Statement, 1885. Even today, but for the steady stream of tourists, the garden has a tranquility and the tomb chamber remains unadorned. Is this not the tomb that befits the simple piety of real Christians? Pity it's as fraudulent as the Catholic extravaganza down the road. The so-called "Garden tomb" may be a palpable fake but the Catholic shrine is no less a fraud. It is simply older. Given the paucity of biblical directions ("without the gate ... nigh to the city") the place of execution could have been anywhere. Likewise, the holy tomb. Which rather nicely left a great deal of scope for fraudsters to concoct a tableau to delight and delude the foolish – particularly when commanded so to do by the ruler of the world. Emperor Constantine gave the heart-warming reassurance that "money was no object". "I have no greater care than how I may best adorn with a splendid structure that sacred spot, which, under Divine direction, I have disencumbered as it were of the heavy weight of foul idol worship; a spot which has been accounted holy from the beginning in God's judgment, but which now appears holier still, since it has brought to light a clear assurance of our Saviour's passion. "It will be well, therefore, for your sagacity to make such arrangements and provision of all things needful for the work, that not only the church itself as a whole may surpass all others whatsoever in beauty, but that the details of the building may be of such a kind that the fairest structures in any city of the empire may be excelled by this ... artificers and labourers, and whatever they shall understand from your sagacity to be needful for the advancement of the work, shall forthwith be furnished ... columns and marbles, whatever you shall judge ... to be especially precious and serviceable ... the ceiling be ornamented with gold ... whatever quantity or sort of materials we shall esteem from your letter to be needful, may be procured from every quarter, as required, for it is fitting that the most marvellous place in the world should be worthily decorated." Although today's apologists love to suggest a "tradition" of early visitors to the tomb of Jesus (without a shred of evidence), nothing can disguise the fact that until the 4th century Christians got along just fine without a Jesus tomb and had no special reverence for the place of his supposed execution. After all, his kingdom was "not of this world". "The truth is evincing itself daily by fresh wonders, so our souls may all become more zealous"
In May 325, about three hundred, of perhaps eighteen hundred, ordained bishops gathered for Constantine's "religious policy conference" at Nicaea on the Bosphorus. Constantine may have attributed his mastery of the Roman world to divine favour but he certainly understood the political value of a universal religion identifying his own person as God's regent on earth. After Constantine, for more than a thousand years, monarchy would be made secure and unfettered by a "divine right of kings", an article of faith in the empire of Christendom. The creed eventually hammered out at Nicaea would have immediate and material consequence for the soon-to-be Holy Land. Three richly endowed churches would give concrete form and physical presence to a religious ideology codified eight hundred miles away by churchmen, most of whom had never stepped foot in Palestine. The new state religion required its hallowed ground: a church to mark where the new deity had taken form in the womb of a virgin, a church to glorify the spot where his lifeless body had been resurrected to life eternal, and a church to honour the place where he had ascended to heaven. "The three spots memorialise some of the most fundamental passages of the Nicene Creed. For this asserts that Jesus was born of the Holy Spirit and the Virgin Mary (the Nativity Church at Bethlehem), was crucified and died and rose again on the third day (the Church of the Holy Sepulchre), and ascended into Heaven to sit at the right hand of the Father (Church of the Ascension)." – Romer, Testament, p 223. Urged on by Christian fervour, Constantine made the overthrow of the old gods a matter of state policy. Helena, the emperor's aged mother, was more than willing to ease her impending transfer to heaven by devoting herself to the task of sanctifying appropriate sites in Palestine. Yet the "discoveries" of the dowager empress were not the consequence of divine guidance or even joyful serendipity. They were the implementation of a state policy determined by an imperious and superstitious monarch and a coterie of senior churchmen at Nicaea. Each and every "Jesus venue" would displace a venerated pagan shrine. Before Helena "progressed" in regal splendour to the east, Constantine had already issued instructions to his Palestinian bishops. A careful reading of the Life of Constantine reveals the sequence of events. At first, the tomb of Jesus was unknown to all. "This sacred cave certain impious and godless persons had thought to remove entirely from the eyes of men ... these devices of impious and wicked men against the truth had prevailed for a long time ... the monument of his most holy Passion, so long ago buried beneath the ground, should have remained unknown for so long a series of years." Constantine, heady with the success of Nicaea and urged on by scheming bishops to build a New Jerusalem on the despised city of the Jews, ordered the destruction of the Hellenistic temples of Aelia Capitolina. Macarius, the Christian bishop, was delighted. It eliminated the pagan competition and he knew a state-funded church would follow. "Constantine ... calling on the divine aid, gave orders that the place should be thoroughly purified, thinking that the parts which had been most polluted by the enemy ought to receive special tokens, through his means, of the greatness of the divine favour. As soon, then, as his commands were issued, these engines of deceit were cast down from their proud eminence to the very ground, and the dwelling-places of error, with the statues and the evil spirits which they represented, were overthrown and utterly destroyed." The first target was the Hellenistic temple built by emperor Hadrian two hundred years earlier. The pagan edifice was destroyed and engineers readied the site for a new construction. More than a year had passed when, "contrary to all expectations", an ancient tomb came into view. The opportunistic priests immediately proclaimed the tomb to be that of Christ. "As soon as the original surface of the ground, beneath the covering of earth, appeared, immediately, and contrary to all expectation, the venerable and hollowed monument of our Saviour's resurrection was discovered. Then indeed did this most holy cave present a faithful similitude of his return to life, in that, after lying buried in darkness, it again emerged to light, and afforded to all who came to witness the sight, a clear and visible proof of the wonders of which that spot had once been the scene, a testimony to the resurrection of the Saviour clearer than any voice could give." The joyful news was relayed back to Constantine, whose "piety", ego and ambition were stroked by the momentous discovery. It was Christ's tomb, of course, because the divinely chosen monarch had foreseen the event in one of his all too frequent visionary dreams. The imperial purse strings were opened and the nouveau riche church engorged itself. "Immediately after the transactions I have recorded, the emperor sent forth injunctions which breathed a truly pious spirit, at the same time granting ample supplies of money, and commanding that a house of prayer worthy of the worship of God should be erected near the Saviour's tomb on a scale of rich and royal greatness. This object he had indeed for some time kept in view, and had foreseen, as if by the aid of a superior intelligence, that which should afterwards come to pass." The "pilgrimage" of Helena which followed in the year 326 was an inspection of a fabulously expensive work-in-progress by a member of the divine household. She did not find the "true cross" but quite possibly was presented by a groveling cleric with a set of nails said to have pegged Jesus to his stake. These unusual "lucky charms" the empress sent back to her son. He had one mounted on his helmet and another in his horse's bridle. It began the thoroughly shamanistic degeneration of Christian belief in which anything deemed to have been touched by either the dead or living Jesus was transmuted into a potent instrument of divine magic. Helena appears to have spent time at Bethlehem and Nazareth unsuccessfully seeking Jesus artifacts before a sojourn on the Mount of Olives. Here a Church of the Ascension was under construction. She is even said to have identified Jebel Musa as the Mount Sinai where Moses had received the ten commandments, a location unknown even to the Jews. 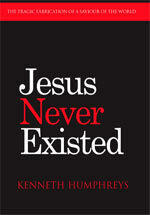 Helena died the following year, no doubt content that she had quite literally put Christianity on the map. A generation later, she was to be credited posthumously with the discovery of the tomb and the true cross itself (St. Ambrose, De Obitu Theodosii). One might legitimately wonder how the priests, who supervised Constantine's builders, managed to so quickly recognize the tomb of Jesus. One hole cut into rock is very much like another hole cut into rock. Obviously there were no bones with which to recognize the "resurrected" saviour and, of course, his burial garments were well on their way to Turin. Indeed, Constantine's rotundra ploughed straight through an ancient catacomb ("as old as the kingdom of Israel", Romer, p179), such was the regard for ancient Jewish burial sites. A remnant of this tomb now masquerades as the last resting place of Joseph of Arimathea and Nicodemus. In that, there is a clue to the origins of the "tomb of Jesus". A lie, dreamed up in antiquity and still circulated by Christians, was that the iniquitous pagans had first buried and then built upon the tomb of Jesus. It was said that the Roman Emperor Hadrian, in his hatred for the true religion, had ordered the whole area be buried and a large platform made ready and a temple erected there to Aphrodite and his own vanity. Jerome, in contrast, reports that it was a statue of Jupiter which stood on the site for 180 years. The honoured god may even have been Tyche, which shows up on coins for the period. The temple may even have served a number of deities. A temple of some kind is certain. But did it bury any tomb of Jesus? A cross-section through the temple precinct of Aelia Capitolina – and what is now the site of the Church of the Holy Sepulchre. One hundred and eighty years after Hadrian, when the egomaniac Constantine made available near limitless funds for instituting the holy places of Christianity, Hellenistic temples were a primary target. The temple of Venus/ Aphrodite in Aelia was particular vulnerable, unloved by either the nouveaux riche Christians or Jews who had re-entered the city over the course of two centuries. When Constantine converted the empire to Christianity, he had the pagan temple dismantled, the earth removed and a church built on the spot. The destruction of the Hellenistic sanctuary by the vindictive Christians was more or less total. However, temples still extant in other cities of the region provide a good indication of the probable size and style of the pagan sanctuary and excavation of the Cardo Maximus (the main north-south thoroughfare) and sections of the precinct platform (temenos), make it possible to approximate the location of the Hadrianic temple. The sacred precinct was larger than any of the Christian churches that followed. The 5th century Christian historian Socrates records the fantastic yarn that it was Helena herself, divinely directed, who ordered the destruction of the pagan temple. He relates that when the tomb was cleared of soil, three crosses were found within the sepulchre itself, complete with the nails and the inscription written by Pilate (presumably in the three languages of Luke 23.38)! Apparently, the correct cross was identified by its ability to cure a dying woman – although John Chrysostom was happy with the explanation that it was the "one in the middle", such is the awesome naivety of the pious imagination! The building of Constantine's Church of the Anastasis (Resurrection) was a religio-political act of Christian triumphalism. The old gods were to be destroyed physically as well as ideologically. It suited the political and religious policies of the first Christian emperor to "find" the tomb of his saviour at the very centre of the city which he would style the New Jerusalem, facing the forlorn ruins of the old. In particular, it was an ideologically imperative to displace the other tomb that honoured a "man made god" and held the mummified remains of the conqueror (and saviour) of the world. The tomb of Alexander the Great had drawn pilgrims from across the Hellenic world for more than five centuries. Emperors and Roman grandees had joined the throngs of local pilgrims that made the journey to Alexandria to catch a glimpse of a sepulchre of the "greatest man who had ever lived", fabulously adorned with gold and precious gems. Augustus, after his defeat of Mark Antony, had Alexander's mummy removed from its sarcophagus and crowned the head with a golden diadem (Suetonius), in the process accidentally breaking off part of Alexander's nose (Dio Cassius). Caligula stole Alexander's breastplate for his "campaign" in Gaul, no doubt for its talismanic qualities. Caracalla draped Alexander's grave with his own imperial cloak (Herodian). The shrine of Alexander, venerable and loved, was an intolerable affront to the new dogma of Christ and did not long survive Constantine's triumph. A superior, "authentic" tomb for Jesus was certainly not too much to ask and imperial engineers soon hacked away enough rock to satisfying their paymaster. An entire district of Alexandria was named The Soma ("dead body") in honour of Alexander's tomb. By the end of the 4th century church patriarch John Chrysostom could boast that Alexander's tomb no longer existed – a victim of Christian iconoclasts and official disapproval. The so-called Sarcophagus of Alexander in Istanbul (left) is actually the ornate coffin of one of the king's Persian provincial governors. Even that is very impressive. Despite the claims of Eusebius that the very fabric of the pagan temple, "polluted by demons", was carted far off, the more useful stones found their way into the new edifice, as recent excavations show (see below). Curiously, Eusebius failed to mention that not only the tomb of Jesus but Golgotha itself had been found by Constantine's builders. The reason is simple: the noble bishop remained convinced that Golgotha was in a different place entirely! "Golgotha. 'Place of the skull' where the Christ was crucified. It is pointed out in Jerusalem north of Mount Zion." – Eusebius, Onomasticon, 365. Melito of Sardis, the 2nd century bishop of Asia Minor, had been even more vague about the site of the crucifixion, describing it as taking place “in the middle of the street, in the middle of the city” (On Pascha). No green hill far away for this guy. Luckily, fifty years after Eusebius had celebrated the unexpected discovery of JC's tomb, it was noticed that the site of the Lord's crucifixion had indeed moved from Mt Zion to a far more convenient spot within Constantine's big church. An outcrop of limestone, which had probably intruded innocently enough in the vicinity of the Temple of Venus, entered the Christian dreamscape as a place of sanctity and awe. The reigning bishop, Cyril of Jerusalem (c.315-386) declared Golgotha to be the "mid-point of the earth" (Catechesis, 13.28). Even the ancient sockets that had held the cross were identified and, by some mysterious osmosis, had themselves become holy. It was Cyril who instituted a two-day observance which began each Easter Thursday. Passages from the Passion narratives were read aloud while the faithful solemnly followed a processional route from the Mount of Olives to Constantine's church. It was the origin of the Way of the Cross (the Via Dolorosa from the 16th century). In 417 Emperor Theodosius II had the large wooden cross mounted on Calvary replaced with one made of gold and precious stones. The holiness just kept on growing. The present, patched-up crusader church occupies less than half of the area of the 4th century Constantinian structure. The Church of the Holy Sepulchre is sited on the central area of what was once Hadrian's sacred precinct. "Through the favour of God, the holy places which had been hidden were revealed." – Cyril of Jerusalem (Letter to Constantius II, c 339). For centuries, the centre of the Greek world had been marked by the omphalos or "navel stone" at the sanctuary of Delphi. But the Christians found this intolerable. With the triumph of the One True Faith the sanctuary at Delphi was impoverished, attacked and ultimately destroyed. The earth's centre now moved to the splendid new church in Jerusalem and an inert limestone rock displaced the claims of Delphi. By the 6th century, Calvary was being celebrated as the "sacred navel" of the world (Sophronius of Jerusalem, Anacreontica), and mediaeval Christian mapmakers coined the term "Holy Land" with Jerusalem at its centre. The rock within the church within the city became the epicentre of salvation, towards which all nations should progress in homage and supplication. The aggrandizement of the "holiness" of Jerusalem proved to be a powerful weapon in the battle of the patriarchates. The eventual triumph of Rome over its more sanctified rivals in the east had more to do with the onslaught of Islam than with Rome's own inferior claims. More honoured in the past than now, today a humble marble vase on the floor of the Catholicon, half way between a rock and a hard place, marks the geocentric pivotal point. Constantine's showpiece did not survive the Muslim era. 12th century Crusaders built a smaller, cruder church on the ruins, but one not lacking a panoply of religious novelties and relics to entice and fleece intrepid pilgrims. For the knights of Christendom, Calvary turned out to be a remarkable "hill" indeed. Unbelievably, the tomb of Adam now emerged from beneath the slab of limestone called Golgotha. It seems that Adam – yes, the first man from Eden – was buried on the very same spot that Jesus was crucified! Origen seems to have floated this idea as early as the 3rd century (In Matth. 126) but now the "theology" gained a visible presence in the world. As far as the Jews were concerned Adam's grave was in Hebron with the rest of the patriarchs. In the new "tradition", when Jesus died on the cross his blood trickled down to touch Adam's skull, and thereby redeemed the first sinner and hence all mankind. – Fr. Daniel, Russian Abbot (c. 1106). Should you doubt the veracity of this remarkable event be assured that the Holy Sepulchre theme park provides all the evidence that the pious mind might require. The tomb (or chapel) of Adam is actually hacked out of the rock below Golgotha (directly below the Greek Orthodox chapel) for all to see. Authenticity is vouchsafed by a nifty little window which gives a view of the sacred limestone, complete with crack from the very moment "Jesus gave up the ghost" (or perhaps where a Crusader pickaxe missed its mark). Tomb of Adam (aka "The Cave of Treasures"). During excavations, Godfrey de Bouilon, first crusader King of Jerusalem, modified the brickwork for his own use. Today the Chapel of Adam has a glass plate window through which you can see the very crack in the stone through which JC's blood trickled onto Adam's skull. Divine earthquake damage – or just a crack in an ancient lump of limestone? The tomb of Adam was not the only Crusader innovation. When Latin knights explored the remains of Constantine's church in the early 12th century, they broke into a cellar beneath the ruins of the ancient basilica. The subterranean passages had previously been something of a forbidden zone. "For many centuries these pits under Calvary were bricked off from the church above because, it was believed, they had led straight to Purgatory and the cries of suffering would disturb the congregation in the church above." – Romer, p179. Overcoming their fears, the Crusaders built a stairway into the rediscovered crypt. With a new "holy" chamber at their disposal, the "discovery of the true cross" of Greek legend was discretely and sensibly moved from the sepulchre itself to the now accessible dank cellar a couple of hundred feet further east. The cellar metamorphosed into the "grotto" of Helena and at the far end a space was sanctified as the "Chapel of the Invention of the Cross". You can't beat that for candour! By the time the Latins were expelled from the Holy Land the whole Christian quarter and much of the Old City was a riot of holy shrines, churches, monasteries and pilgrim hostels. Today the "grotto" of Helena is known as the Chapel of St Helena. No doubt for a small remuneration to the Armenian monks a slither of wood can still be purchased. Has anyone worked out how three crosses purportedly from circa 30 AD got themselves into a cistern built in the 2nd century? Down into the old basilica. In the early 1970s the Armenians opened up another section of the ancient basilica's foundations, exposing several walls from the 2nd century and evidence of very ancient quarrying. These finds gave the lie to Eusebius' claim that the polluted spoil of Hadrian's temple of Venus "had been carried far off". But they also revealed a delightful etching of a Roman ship on one of the temple's foundation stones. Amusingly, the Armenians named the new chamber for an Armenian warrior saint ("St Vartan"), and claim the ship is the work of a 4th century Christian pilgrim – well they would, wouldn't they? The "chapel" is kept closed to the public. Did Hadrian bury Golgotha and the tomb of Jesus? In the "origins fantasy" dreamed up by the Christians, their numbers were always more numerous and their struggle always more heroic, than history bears witness. In Christian mythology, as it relates to the Holy Sepulchre, Hadrian had deliberately built his pagan sanctuary over sites holy to the fans of Jesus. The idea is palpable nonsense. "Christians would later accuse Hadrian of deliberately desecrating this holy place, but it is most unlikely that the emperor had even registered the existence of the obscure church of Jewish Christians in Jerusalem." – Karen Armstrong, A History of Jerusalem, p165. It would be bizarre beyond credulity that the ruler of the world would just happen to site the shrine of his favourite goddess directly above a rock-cut tomb rumoured to be associated with the prophet of a cult which at that time was virtually unknown in the Roman world. In reality, the emperor sited his temple/forum complex precisely where it would be found in most other Roman cities – at the intersection of the major east-west and north-south roads. Remnants of a Hadrianic triple arch which opened onto the forum and part of the retaining wall of the temple precinct are visible in the basement of the Russian Mission ('Alexandrovsky Hospice' but not a hospice at all). The Russian Orthodox moved into a vacant lot near the Holy Sepulchre in the mid-19th century. Fortuitously, their mission preserved the underlying evidence of a nobler, pagan past. In the same building a nondescript 2nd century door sill is protected by glass and hallowed as part of the Jesus trail, the "Judgment Gate", supposing it to be a gate in the elusive "second wall". Dwarfs on the bones of giants? Within the Alexandrovsky Hospice, a triumphal arch of Hadrian. "Now in the place where he was crucified there was a garden; and in the garden a new sepulchre, wherein was never man yet laid." – John 19.41. Omitting all later building work, the supposed "holy sites" of Christianity produce a surreal 1st century landscape. All the features of the dreamscape fall within a hundred and or so paces. The "garden" of John's gospel is the size of a dog kennel and the hill of Calvary has sides inclined like a tepee. The top of the Golgotha rock measures barely 6 feet by 12 feet. It must have been quite some squeeze, fitting in three crosses, all those soldiers and a posse of wailing women! A Florida theme park (The Holy Land Experience - yuck!) rather nicely captures the fantasy of a hill and a tomb in a convenience-sized carryout pack. How wonderfully reassuring that the human imagination, which gave us the Holy Sepulchre and Golgotha, is alive and well and has taken up residence in Hollywood. Jesus, we now learn, had a son named Judah and was buried alongside Mary Magdalene, his wife, in a "family tomb" a mile or so south of the Old City. Such are the claims of film makers Simcha ("Ali G. meets Indiana Jones") Jacobovici and James ("Titanic") Cameron, with encouragement from New Testament scholar James Tabor whose own book The Jesus Dynasty promotes the "family of Jesus" notion. The tomb from the 2nd temple period (6th century BC - 1st century AD) at East Talpiot is real enough. It was discovered in 1980, two miles south of the Holy Sepulchre site, together with ten ossuaries (stone bone boxes) in situ. The ossuaries were removed, catalogued, and basically forgotten. There are, after all, thousands of similar ossuaries and hundreds of known tombs. At some point, one of the ten bone boxes from Talpiot – an uninscribed one, left in a storage yard – was stolen. The tomb itself is now buried under an apartment block and is not open to the public. "This places us smack dab in The Da Vinci Code territory but is it possible that Dan Brown had at least some of it right? It requires a flight or two of fancy, but if we connect a few dots we can draw a line through history from the tomb straight to today." – from the website "Jesus Family Tomb"
Enter Jacobovici, a journalist/film maker who mines biblical history for sensational stories. Having already traced the tribe of Dan to Crete (at least to his own satisfaction) and credited the alphabet to Hebrew slaves in Egypt, the "naked archaeologist" is one of the few defenders of the authenticity of the infamous "James brother of Jesus" bone box. He has now managed to finesse said box into a "missing link" for his latest extravaganza – the family tomb of Jesus. With breathtaking flair and audacity team Jacobovici/Cameron/Tabor take 2 + 2 and manage to produce an answer of 17. The cluster of names on the half dozen inscribed boxes from Talpiot are statistically indicative of the famous New Testament family. Sure. DNA analysis of bone fragments within the boxes show that the “Jesus – or is that Hanun? – son of Joseph” skeleton was not related to the “Mariamne the Master” – or is that Mary and Martha? – skeleton and therefore the two must have been married. Sure. Which means the “Judah son of Jesus” skeleton was the son of the Son of God by Mary Magdalen. Hooray, don't we all want MM to be rehabilitated? The "James ossuary" (now with a "genuine" inscription) completes the set. It has to be the very box taken from the storage yard, and its contents were once the famous brother of the even more famous messiah. Which surely opens the way for the next blockbuster, Jurassic Jesus, in which the messiah's DNA is extracted from a bone fragment and is raised from the dead. DVD, anyone? Christians – Protestants now as well as Catholic and Orthodox – give credence to what they believe was the joyful discovery of the "holy sepulchre" of Jesus, although many would distance themselves from the miraculous "finding of the true cross", parts of which, infamously, became the most desirable and ubiquitous relic in medieval Christendom. They are probably embarrassed by the blatant chicanery that permeates the whole "Jerusalem experience". But if there were no miraculously preserved artifacts within the sepulchre, how, then, was the tomb identified? It is beyond intelligent belief that, in the aftermath of two destructive wars (66-70 and 132-135), with decades of desolation in between, and with a wholly reconstituted, pagan population, that any "tradition" of a tomb belonging to a Christian godman, could or would have been preserved. With mental gymnastics that would make a medieval churchman blush, modern apologists argue that Christian pilgrims would have scratched graffiti on the tomb to the effect "Jesus was here"! And this, despite the sacrilege of such vandalism and the supposed indelible memory that the tomb location supposedly had in the minds of generations of Christians. For all the sophistry, there is no evidence of early Christian pilgrimage to the site of any Jesus tomb or place of execution. Such "pagan" reverence for holy places was alien to the first Christians. St Paul, for example (assuming for the moment he even existed) showed no interest in such earthly trivia. Even Eusebius was lukewarm to the vulgar notion of sanctifying specific locations – but he was obliged to "get with the program". The reality of the deception is very simple – and the Christians have honoured the practice ever since. Armed with their holy story they fabricated a landscape to fit the fantasy. In time, every jot and tittle of the Jesus fable would have its sanctified venue and pilgrim shrine. There was no "empty tomb" because there was no tomb. But when a Roman shovel happened to uncover an ancient catacomb, the opportunist priests exploited the chance discovery for all it was worth. Aelia Capitolina – City of the Evangelists? Copyright © 2007 by Kenneth Humphreys.